Hey y'all! With Christmas only a couple of days away, I thought I'd share a little project I made for my friend Ale. Ale and I originally met on Instagram and quickly bonded over our mutual love of both sewing and Harry Potter; we finally met in real life when I taught at Sewing Summit last year. Last Christmas we decided to exchange HP themed Christmas pillows and so (as Ale dubs it) "A Very Harry Christmas" was born! I never had the chance to share the pillow I made for Ale, but since Christmas is here again, I figured now is a great time! This picture was totally stolen from Ale since apparently I no longer have the pictures I took (they were on my phone that died). I used the same sketchy applique method that I outline in this tutorial; most of the pieces were traced onto fusible web using templates (like the letters), but some of the smaller bits (the socks, the snitch, etc) were drawn freehand. 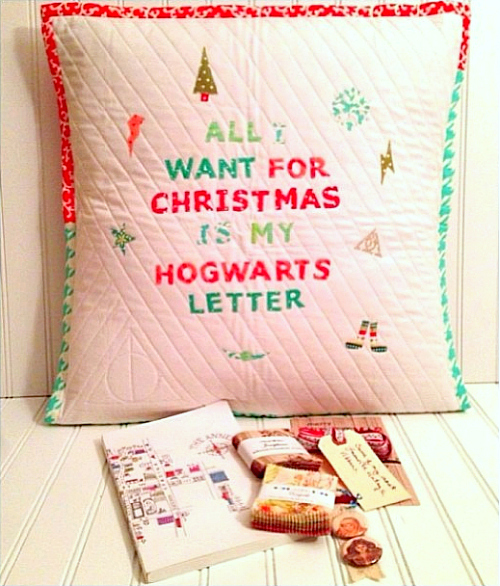 Like the Lumos/Nox mini I made, this pillow was also quilted with the Deathly Hallows. This is one of the only photos I have from when I was working on the pillow, but you can see the applique method a bit better. Most of the fabrics used come from Bonnie and Camille's Vintage Modern collection and the pillow is finished with an envelope-style back. In the spirit of the holidays, here is the Christmukkah card that Alex and I made and sent out. Since I forgot to take pictures before mailing all of the cards, I totally stole this one from my friend Tracey. Hmmm, I starting to detect a theme here... reminder to self: take your own pictures. I hope that you all have a lovely holiday season and get the chance to relax a bit. I'm uber-excited to have some time off work so that I can get down to the business of sewing - woot! Hey y'all! So, it's Sew Mama Sew Giveaway Day - one of the funnest days of the year. For everyone that has been around here before - hi! 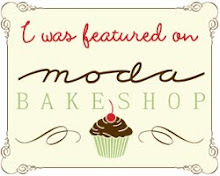 - for anyone new to my world, pull up a chair, put up your feet, and feel free to stay awhile! This is Orion and it's the most popular of all of my patterns. 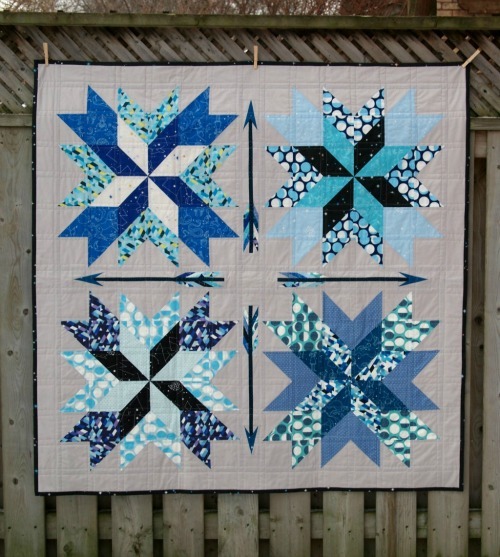 It features giant stars and paper-pieced arrows. 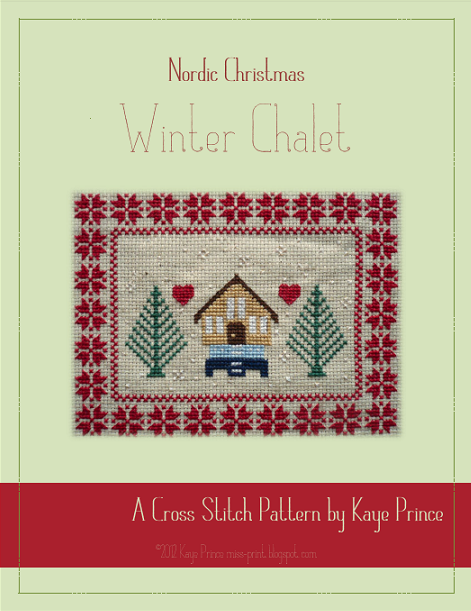 This is Winter Chalet and is part of my Nordic Christmas cross stitch collection. 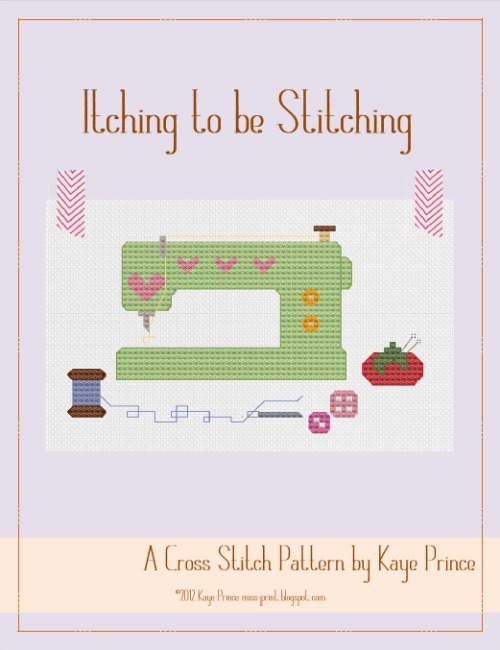 Itching to be Stitching is the first pattern that I released as an independent pattern (if you'd like to see some of the free patterns that can be found on this blog or in magazines and books please see my full pattern page). 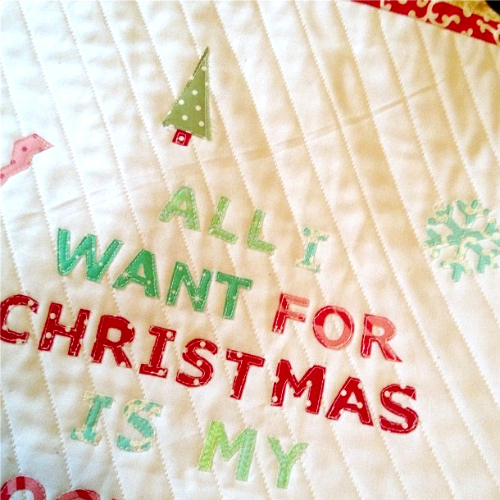 And remember, there are more quilt and cross stitch patterns in my shop to choose from if you win! So I betcha want to know how to enter, right? Christmukkah around these parts, so we've got lots going on. That's it! Two easy-peasy ways to enter! 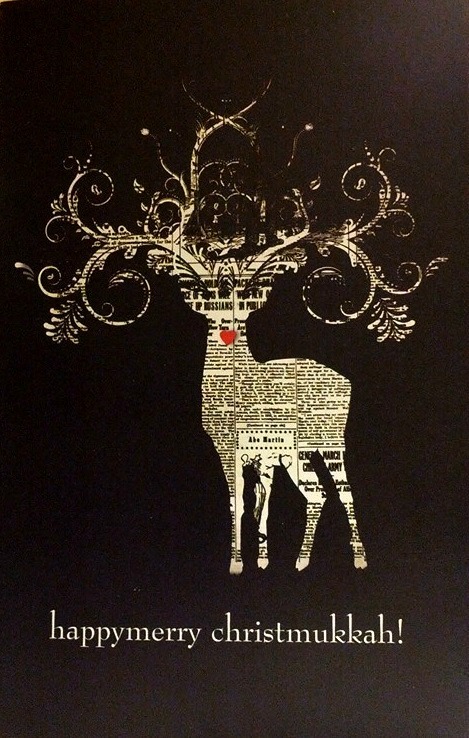 I will close the comments on December 12th and announce the winners here on the blog. International entries are, as always, welcome! Also, please remember that I have comment moderation enabled so if you don't see your comment right away it just means that I haven't had the chance to approve it yet (duplicate comments will be deleted). 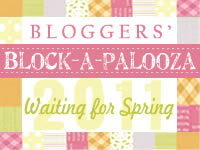 Be sure to head on over to Sew Mama Sew to see all of the other wonderful giveaways that you can enter! There are supplies and handmade items to be won!